Pierre Bonnard was born at Fontenay-aux-Roses near Paris in 1867. He attended law school, but in 1888 switched to study painting at the École des Beaux-Arts and the Académie Julian, where he met Édouard Vuillard, Maurice Denis and Paul Sérusier. Strongly influenced by the art of Paul Gauguin and Japanese woodblock prints, they formed the Nabis group (the name is the Hebrew word for ‘Prophets’), emphasizing the decorative qualities of painting. 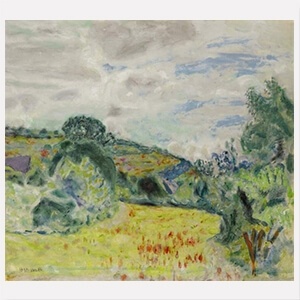 Bonnard’s work is characterized by a highly patterned style and the use of rich hues of colour. He is famous for his intimate sunlit interiors, still-lifes, and luminous landscapes.